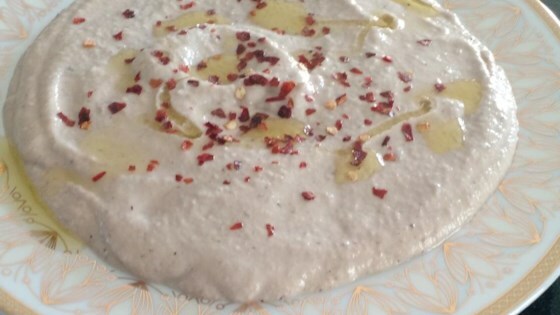 "Baba Ghanouj is a traditional Middle Eastern appetizer. My version of Baba Ghanouj uses pomegranate molasses instead of lemon, and crushed walnuts for texture. This can be made a day ahead. Bring to room temperature, drizzle with olive oil, and serve with pita bread." Preheat oven to 400 degrees F (200 degrees C). Line a baking sheet with aluminum foil. Prick the skin of the eggplant in several places and place on the baking sheet. Roast eggplant in the preheated oven until tender and skin is blistered and blackened, 40 to 50 minutes. Cool until easier to handle, about 10 minutes. Cut the eggplant in half, scoop out the pulp and cut into pieces. Discard any seeds. Mash garlic and salt into a paste using a mortar and pestle. Add eggplant pieces and mash until smooth. Stir in tahini, pomegranate molasses, yogurt, and walnuts, mixing well to combine. Transfer to a small bowl, cover with plastic wrap, and chill. You can also cook the eggplant on a grill or directly over the flame of a gas stove if you prefer. I use a mortar and pestle because it gives a nice texture. You can use a food processor instead. This is perfect, Turkish-style baba ganoush.